George Gerards sent in a cross-stitch pattern of a B-24 that Helen Thompson received some years ago. If anyone feels ambitious enough to make one, please send Barb Gotham a note, so she can send you the pattern - it is too large to reproduce in our newsletter. Approximate stitched area is 22-1/2 x 6-1/2 (14 count Aida). I hope your reunion in Washington is a happy one and please pass on my wife Mary's and my own regards and only wish we could be with you. We still have fond memories of the hospitality extended to us at the Tucson reunion and of course will never forget the sacrifice the members of the 380th Bomb Group made to save Australia from invasion so that we can enjoy life as it is today. May you all continue with good health. God Bless you all. Kind regards, Neville Eastlake Lest we Forget. While I unfortunately have not been able to participate in any way for very obvious reasons, I have always looked forward to receiving your news letter, a great and continuing reminder of my days (and nights) spent at Corunna Downs. Even while serving there as Radio Telegraphist in the R.A.A.F., while your group was staging out of there, the closest I ever got to being associated with any of your members was when we were eating in the same mess. I shall never forget the first day of the arrival of the 380th. I was spine bashing (lying on my bunk) after nightshift when all hell broke loose with the sound of gunshots, a most unfamiliar sound in that area. My first thought was that the Japs., who constantly sort us out because they were very upset at the way the 380th kept bombing the hell out of them, had arrived. I must say I was greatly relieved to be told "The Yanks have arrived" because I don't think my ancient .303mm Lee Enfield had been cleaned for many months. I believe a group of them had wandered over to the creek and were pot-shotting at anything that moved. Having no desire to die of lead poisoning, I remained recumbent and thanked God. I'm sure that the memories will always live on with the entire crew. I meant to write a couple of months ago when I first rejoined the group keeping alive the memories and achievements of the Flying Circus -- 380th Bomb Group. When I read the remarks of Claude Baugass, one of the 529th ground personnel, I realized I should write if only to thank him and his fellow mechanics, armorers, clerks, etc., for their dedication and skills. The crew with which I flew as radio operator (Spencer's Crew, 528th) flew from Fenton Field and Mindoro our full tour of long and often lonely missions and had only one engine shutdown in all that time. That shutdown was a pilot shutdown because we had been hit by flak and had gas pouring out behind #3 engine. Lt. Spencer wisely shut down #3 to prevent an explosion or fire while T/SGT Roger Grieve, our flight engineer, transferred fuel from the ruptured wing tank cell, while I shut down the radios in the waist. It still amazes me that during that war the U.S. Army could take kids, mostly draftees, 17 to 20 years old and in a few months train them to repair engines, operate radios, handle explosives, cook meals and countless other tasks -- all things they had no idea they were capable of doing. Congratulations to all of us! It's good to look back on a very exciting time of our lives. Things aren't as exciting now. And my travels aren't 10 to 12 hours over a quiet ocean, but instead they are, as my friend said -- "trips to the doctor and to the bathroom." One of the things they have is the last operating tank that crossed the Rhine River - they saved it from Otis AFB when it was going to be used for target practice. There is also a display of the same kitchen my mom had when I was a kid! I just want to thank you and all those responsible for the site you have created on the 380th. I won't take a whole lot of your time, but I thought I had to share with someone the joy this site has given me. My name is Chris Harper. I'm a missionary kid who's father served as a southern Baptist missionary physician in Kediri, Indonesia from 1972-1982. While a child in Kediri, we had a fascinating guest in our home by the name of Ais Pormes. He was a pastor who originated from the island of Seroea in the Banda Sea. I remember him telling me a harrowing tale about when he was a young man during WWII. He and several other villagers had helped to rescue the survivors of a US bomber that had been shot down by Japanese fighters and forced to crash land just off the coast of Seroea, across from Mr. Pormes village, deep in enemy held territory on 1/19/1944. When the downed crew were later picked up by a PBY Catalina crew, several villagers, including Mr. Pormes, flew back to Darwin with them to give intelligence reports on Japanese movements in and around their island. I was recently telling some old friends from my childhood about Mr. Pormes' ‘keep you on the edge of your seat WWII stories' when I got curious as to whether or not the web would yield any information on the incident. I called my parents to get the correct spelling of Mr. Pormes name and then typed it into my browser just for fun. Up popped several listings! One of the listings took me to a site that was written up by 11 Squadron, RAAF members and I couldn't believe my eyes when up popped two accounts of the crash/rescue that Mr. Pormes had been a party to. One was from the point of view of American Deane Lees, the Navigator of the B24 ‘Doodlebug', and the other from Aussie Sgt. Keith Hamilton, crew member on Catalina A24-32, sent to rescue Doodlebug's survivors. From their written records, I discovered that the Doodlebug had been part of the 531st wing of the 380th heavy bomber group, the "King of the Heavies." So, I typed 380th and Doodlebug into my browser and that's when I came upon your site. To my sheer delight, I could even view the bomber prior to flying, with a close up of the nose art, look at pictures of it crashing at sea, find the crew on board at the time of the crash, the mission target, etc.! For the first time in my life I felt the high of being a historical investigator. I'm currently trying to get more information, if possible, on the details of that raid on Ambon that cost this crew their friend's lives. If there is an account somewhere about the raid and exactly what happened when the Doodlebug was set upon by Japanese fighters, etc., I hope to find it, and your site has given me a head start on it. Thank you so much for everything you and others have done to make this resource available to the public, in honor of those brave men who fought over there. Although he is physically unable to attend Group meetings, he is pleased to hear that others will be doing so! 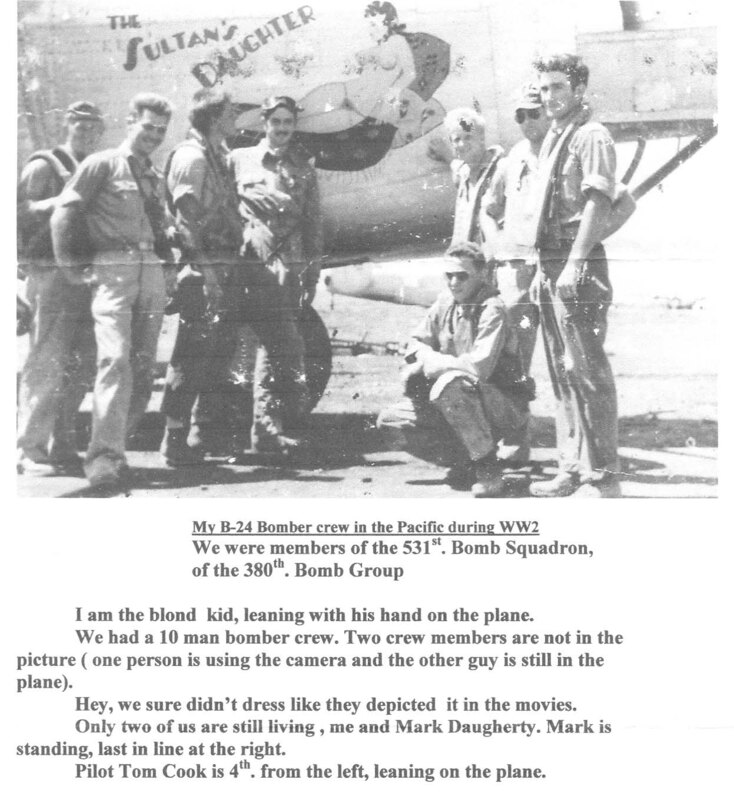 He sent this photo of his B-24 crew.